Clever Bulletin: Obama Congratulate the Royal Family on the "Joyous Occasion"
Obama Congratulate the Royal Family on the "Joyous Occasion"
As soon as news of the royal baby's arrivalwas announced, well wishes for the next in line for the throne began to pour in. 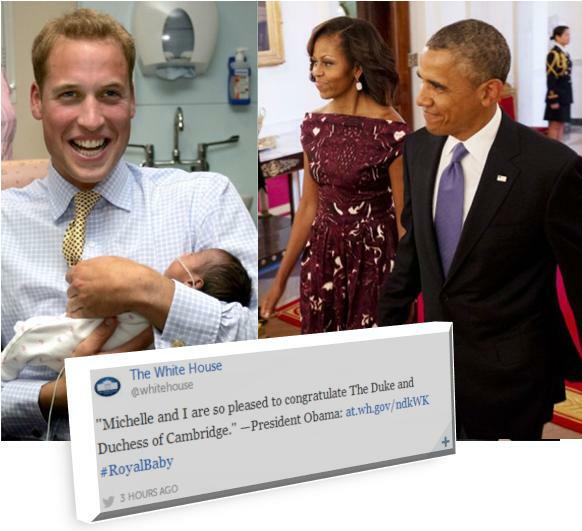 President Obama issued a statement of congratulations to Prince William and Kate Middleton at the birth of their son. After the Duke and Duchess of Cambridge got married in April 2011, the Obamas were able to congratulate them in person following their honeymoon when they visited London that May.